Whither a more inclusive site name? And although the post has many up-votes (9 up-votes is a lot, it is tied for 2nd most up voted meta post), nothing is being done about this. When we do talk to the overlords about getting a name change, we will probably be asked to provide evidence that such a change is necessary. I am preemptively starting this question for users to post evidence. Have you come across academics or other SE users that were confused about what is on topic for this site? Did they think that only cognitive science was on-topic while they wanted to ask questions about neuroscience, affect or social psychology? Please post one piece of evidence (or highly related evidence) of potential users being confused about the name per answer. If you disagree with the need for a name change, then voice your disagreement on the original post not this one. Blog post on "Future perfect"
I.e., the author thinks that the site is for "cognitive scientists"; most researchers in psychology do not see themselves as cognitive scientists. In response to a question on Quora "How will the new Cognitive Science Stack Exchange affect the Neuroscience topic on Quora?" I.e., the person thinks the site is about "cognitive science". They don't think the site is about psychology nor about neuroscience more broadly. This is personal evidence, but I have over 15 years experience in a psychology department where I like to think I have a pretty good understanding of the discipline-specific terms that people identify with. It is quite clear to me that the current branding "cognitive sciences" makes the site feel like it is most relevant to cognitive scientists and cognitive psychologists than for non-cognitive psychologists and neuroscientists. I've been saying this for a long time. Anyone who uses the site will see that the site is much broader, but I think the site name and particularly the welcome message could do a better job of communicating this breadth. 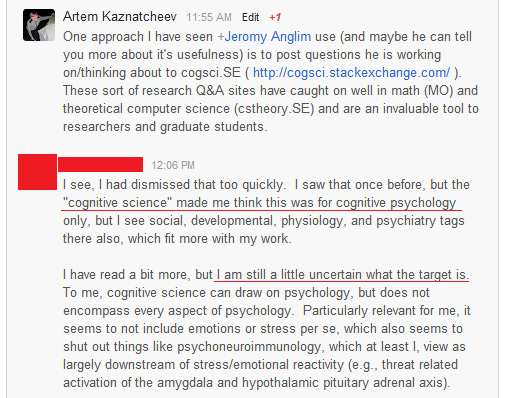 The above is a screen capture of a G+ conversation with a PhD student in psychology. The post was shared with a 'limited' circle so I can't include a link, since I am not sure if the author wants to be anonymous or not. We're scaring off professionals who don't have doctorates. Is this our intention? My mother is seasoned school psychologist, now retired and running her own private practice. I have been suggesting she commit to the Cognitive Sciences proposal since, well, actually, I suggested she commit to the Psychology proposal which is now merged into Cognitive Sciences. Is this the desire? Thomas Owens mentioned a similar thing and I reassured him that the site isn't only for "experts and professionals in the cognitive sciences" -- we need to attract experts but anyone interested in the field of Psychology would be welcome. Is my understanding incorrect? Do we want a broad audience here or is this proposal really only for those with a doctorate? As it stands, if I can't attract industry professionals, I have serious doubts about this site and intend to uncommit. It is more neuroscientific than cognitive in nature, so not entirely clear to me that it belongs in Cognitive Sciences. Why do you not simply rename this site/ask the SE masters instead of making the fourth and fifth redundant meta thread here to agree that this name is unproductive?!? All this meta discussion here between 4-5 user is more or less useless without actually doing the proposed and voted actions. This site seems to create more meta than main discussion. Seeding the main site with content is the problem and attracting experts. Raising the question rate from 2 to 3 will not prevent this site from getting closed like other ones recently. Another option is to ask the SE master to do better advertising of such sites (chemistry.se similar), e.g. putting some the questions on the hot questions front page from time to time. Somebody stumbling over stackexchange.com and interested in psychology is unlikely to notice "cognitivesciences.se" is the way to go or to find its link at all. Chemistry.se had very good and promising proposal stats, but lost many experts due to long process and bad advertising of SE, the area51 is broken for such experimental sciences sites, its time to also ask the SE masters here to help, otherwise I see no reason that any student or professional will invest time in building such sites, when they get closed anyway after 6-12 months. Not the answer you're looking for? Browse other questions tagged discussion name . What should we change the name of our site to, if anything? Name change of CogSci - what about Psychology? What welcome message should we have? Vote for a new site name! How will branding affect the perceived inclusiveness of cognitive science and psychology? What is the current status for the site name change proposal? Should we change the site name to Mind? How to distinguish social psychology from opinion-based questions?